The Kern County Sheriff's Department in California lost an officer in a line of duty motor vehicle accident this past Friday, May 23rd, when Deputy Sheriff James Throne collided with another officer while both were en route to back up other deputies in a foot pursuit following a theft. Fourteen firefighters responded to the accident that occurred around 11:35 p.m. on a highway north of Bakersfield. Deputy Throne was driving a marked patrol car without lights and siren on when he pulled into the path of fellow officer 30-year-old Deputy Doug Swanson of Bakersfield, who was driving a marked patrol car with lights and siren activated. Deputy Swanson was taken to Kern County Medical Center with multiple injuries but is expected to survive. 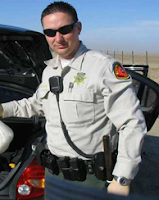 Deputy Throne, age 29, was a two and a half year veteran of the Kern County Sheriff's Department after previously serving with the Taft Police Department. He is survived by his wife Amanda and three sons ages 12, 10, and 7. On Sunday, May 25th, the Bibb County Sheriff's Office in Georgia announced the death of Deputy Sheriff Michael Sean Thomas who passed away as a result of injuries sustained in an accident that occurred on April 26th. Deputy Thomas, a motorcycle patrol officer and eight-year veteran of the sheriff's department, had sustained multiple injuries when he collided with a 1999 Chevrolet pickup truck while on duty almost a month earlier. The pickup failed to yield the right of way while entering the highway and Deputy Thomas was thrown from his motorcycle when it impacted the side of the pickup truck. Deputy Thomas was only 26 years old at the time of his death. Please remember these young men and their family and colleagues they leave behind as well as offer up thoughts and prayers of recovery for Deputy Swanson who remains hospitalized. My thanks to the officers for their service and my condolences to the families. My condolences to their families. These men were way too young to die.